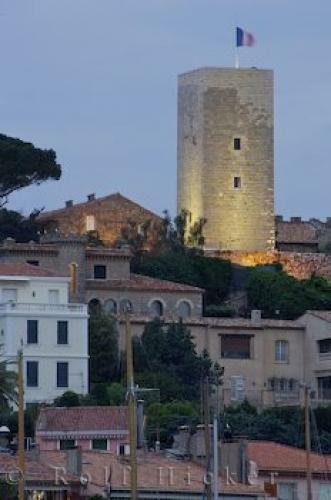 The Castre Tower looms over the charming Old Town known as Le Suquet in the city of Cannes on the Cote d Azur, Provence in France, Europe. Cannes in Provence, France in Europe. ... After your visit to the Castre Tower, the walk down to the port of Cannes is far easier than the climb up.Cannes Castle, Castre Tower and Castre Museum in the Old Town, Le Suquet, The Riviera, Cote d'Azur, Provence, France, Europe. I photographed this photo with the digital SLR camera model Canon EOS-1Ds Mark II, aperture of f/14.0, exposure time of 13/10 sec. on ISO 100, as always I used a original Canon Lens, the focus lenght for this picture was 400mm.